This drug-screening threshold is set by SAMHSA (The Substance Abuse and Mental Health Services Administration) and is the standard for screening in the USA. Reliable, fast, and inexpensive; results are obtained in 3 to 5 minutes. 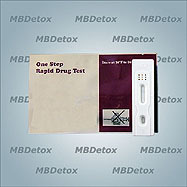 Each single panel urine drug test is packaged individually in a sterile foil pouch. 1. Provide a sample by urinating into a sterile container. 2. Remove the single panel urine drug test from the foil pouch. 3. Dip the end of single panel urine drug test into the urine sample for approximately 5 seconds. 4. DO NOT swish or stir the sample with the test strip. 5. Withdraw the strip after 5 seconds and place it face up on a clean, flat surface. 6. Read the results at 5 minutes. Readings made after 5 minutes may no longer be valid. There are only 3 possible outcomes for the test strip: Negative (passing), Positive (failing), and Invalid. There are two color lines that appear when using the test strip. The 'control line' indicates that the test has been used properly; this line is the darkest and easiest to see. The 'test line' will indicate whether or not K2/Spice (synthetic weed) metabolites are present in the sample; this line is usually not as bright as the control line. The appearance of two color lines indicates a negative test result for K2/SPICE. The concentration of JWH-018 and/or JWH-073 is below the 25 ng/ml cut-off level and is considered a passing drug screen result. The two color bands are seldom the same exact color, with one band being slightly less vibrant than the other. The appearance of only one color line indicates the test is positive for JWH-018 and/or JWH-073 at or above 25 ng/ml. This is considered a failing drug screen and would be followed by more accurate testing to confirm the results. A distinct color line should always appear for the 'control line'. The test is invalid if no clearly visible color line appears.